The Parish of Durrington in the county of Wiltshire is situated about one and a half miles to the north of the town of Amesbury and straddles the A345 road. The parish comprises of the village of Durrington on the east side of the road and the settlement and military establishment of Larkhill to the west of the road. The Parish covers an area of 2702 Acre or just under 4 ¼ square miles. The name Durrington originates in old English as “farm of doers people”(doer-deer-durr, ing-people/tribe, tun-farm/settlement). There is evidence this area has been inhabited from Neolithic times (2 – 3000 BC) and the parish is rich in archaeological remains. It contains the visible sites of two large henge monuments, Durrington Walls, the largest earth bank and ditch henge in Europe, and to the south of it Woodhenge the site of a timber circle. 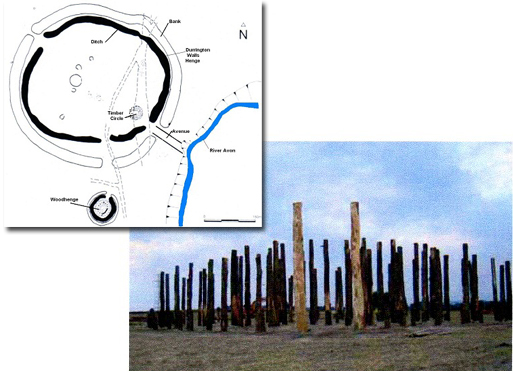 The results of recent Archeological Digs organised by Sheffield University have uncovered evidence of another timber circles like Woodhenge and the remains of hundreds of houses within Durrington Walls. A paved road or entrance linked the Henge with the river. Analysis of animal and human remains suggested Durrington Walls and Woodhenge was where people lived and feasted while Stonehenge was for the dead, and the two places were linked by the River Avon. Modern history can trace the settlement of Durrington back to the Dooms Day Book of 1087. Prior to the Norman Conquest Durrington along with other villages in Wiltshire had been managed by a thane named Harding but post conquest Earl Alberic was in control. By 1200 the village was split with East End Manor becoming the property of the Dean and Chapter of Salisbury and West End Manor became the possession of the family De Nevill with attachment in time to Amesbury Abbey and Winchester Collage. The land was tenanted to local farmers and remained so for many hundreds of years until the Army took over Salisbury Plain as a training ground Although large areas of the village and its surrounding land were sold by auction in 1921, Winchester College and the Chapter of Salisbury still retain ownership of relatively small pockets of land within the village boundary. The other big landowner with land right up to the boundary is the Ministry of Defence. At the registration of the first poll tax in 1377 Durrington was one of the largest villages of its hundred with 139 tax payers. At a similar census in 1901 the population had steadily increased to 427. However with the military taking over Salisbury Plain as a training area in the early 1900’s there was a rapid increase in the population not only of Durrington but of Larkhill. At the last census of 1991 Durrington village had a population of 6926, which was greater than the town of Amesbury. Prior to the start of the 20th Century Larkhill was all agricultural land with isolated farm buildings. However once Salisbury Plain was obtained for military training many changes have taken place. From about 1890 Larkhill Camp started to be developed as a Garrison to support the training activities on the Plain. During WW1 many thousands of troops were billeted on the plain some under canvas others in wooden huts. 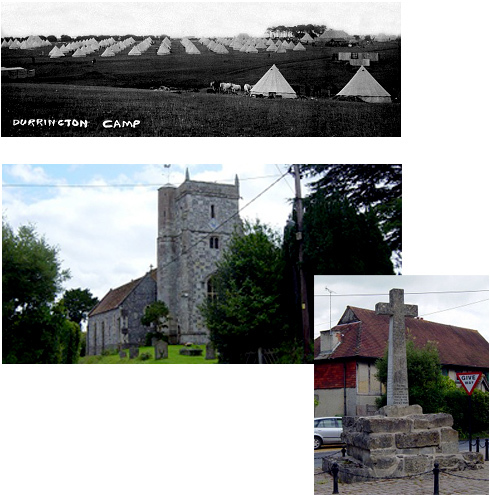 Initially three tented camps were built at Durrington, Larkhill and Fargo with a light railway system serving all three. Following the First World War more permanent buildings were built and the Packway became the main access route. Once the School of Artillary had been established at Larkhill rapid expansion bought permanent Barrack blocks and married quarters. Larkhill has now become like a small town and is almost self-supporting with shops, churches a school medical centre and its own pub. One of the oldest buildings in Durrington is the Anglican Church of All Saints. Although being extended and modified over the years the Nave was built before 1179, with the side chapel added in the C13 and the Tower in the C15. There were originally three bells in 1553, which were refurbished in early C17. Two more bells were added in 1654 and 1660. All the bells were re-hung in 1916 and a final bell added in 1953. On the left is Durrington All Saints Church. The village cross or War Memorial stands in the middle of the road junction at the front of the church. One theory is the base stones originated from the church when the side aisles were added in the C19 and may have been used as May Pole until the War Memorial Cross was erected in 1920 to commemorate those killed from the village in the First World War 1914/18. Durrington has now developed into a fair size village (reputed to be the biggest village in Wiltshire) with three mini supermarkets a garage, two Doctors surgeries, a vet, chemist and a number of individually owned small shops. 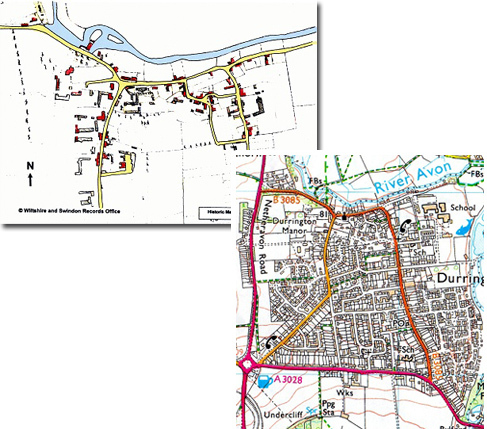 With the presence of a number of MOD establishments nearby the main employer for residents is naturally the MOD but some residents a daily commuting to the other nearby areas of Andover, Salisbury and even as far a field as London.